Hi all! Thank you all for being soooo patient, and stopping by for my post, this round of the International Inkers. A long weekend here, and we packed up our car as soon as the quittin' bell rang, and we had ourselves a lovely weekend away. Now that I'm back, I'm ready to post & so sorry for the latest of it. Hopefully you all had a wonderful weekend, and enjoy the card I've made with Paola's kit! So.. what's in the kit? Ribbons, assorted mix; twine, mini clip, extra large red button, wood tag (by chatterbox), and a leatherette tag (by Jolee's boutique). K& Company, My Mind's Eye, Basic Grey - and a map page. Again, I am so terribly sorry for the late post. It's what happens when you're getting rushed out the door! For your patience, I will offer up a little extra prize. I'll choose a random post on Friday & that winner will get a little surprise in the mail! Thanks again for stopping by! And just in case you haven't stopped by the other Inker's yet... here's where to go! To make up for my late post, I'm going to add a little extra prize!! Totally worth the wait, Kare-bear! I hope you had a great time on your weekend getaway. 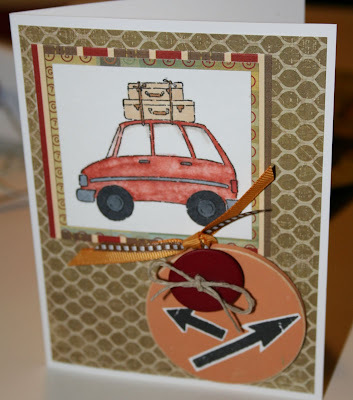 Love how you used the arrows & button to jazz up your round tag! And the way you layered the sentiments inside looks so cool! ditto on what Catherine's saidnodku too! 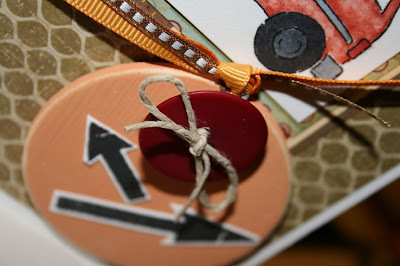 Love loveeee love how cleverly U used the round wood tag ..your card is a beautiful reflection of your fabby creativity!! I love how you have used the kit, your card is great. 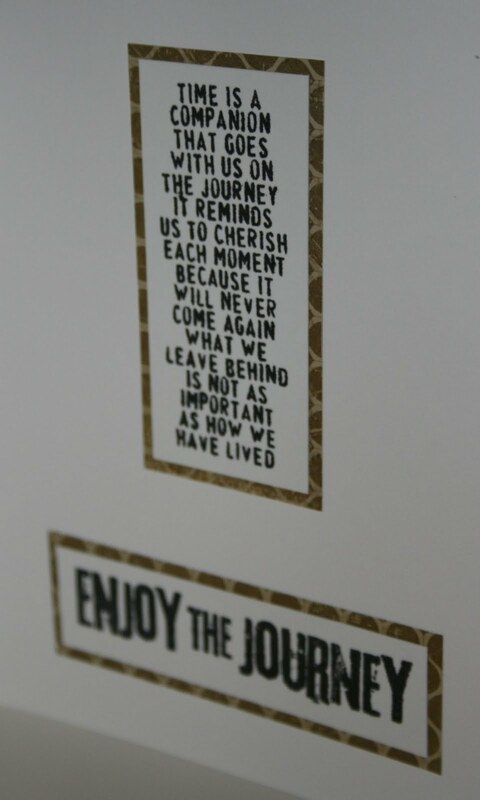 I love the way you used the wording inside the card, very innovative. The tag and arrows are a great touch. WTG Karen!! Am so happy to see you (am jumping up and down)! Love it Karen! I like the way you used the button on the front - I love buttons but always struggle to work them in. The inside is the bomb too - I like that you used the sentiment and the "enjoy the ride". Awesome! Sorry for the late comment - life has been crazy as I'm sure you can understand. Hope you have a fantastic weekend. HUGS!